Book Description: Ten years after the loss of his entire family to madness and death, Ernest Frankenstein finds himself compelled to return to the city of his birth, Geneva, in order to discover if his elder brother, Victor, might still be alive. Only Victor can provide the answers to questions, which have long plagued Ernest. The quest for answers will force Ernest to confront demons, both internal and external, from his past, which refuse to be at peace and which ultimately will endanger both he and his new family. Hunted across Europe their only hope may lie with a French spy, Ernest’s childhood friend, and a mysterious gypsy girl whose people believe that Ernest will lead humanity to its salvation or final destruction. Frankenstein A Life Beyond by Pete Planisek is the first direct sequel to Mary Shelley’s iconic story, Frankenstein, which examined Victor Frankenstein’s quest to both create and kill an unnamed creature that ultimately destroys all but one member of the Frankenstein family, Victor’s brother, Ernest. Frankenstein A Life Beyond explores many of the issues left open by the original, while establishing new characters and mysteries. Add Frankenstein A Life Beyond to your Goodreads shelf! A: Frankenstein A Life Beyond is really a story about family, trust, and justice. These are issues the main character, Ernest Frankenstein, must confront after ten years of trying to out run his family’s dark past. His young Irish wife, Ailis Tierney Frankenstein, who is key to Ernest’s personal rebirth, must confront choices that may destroy both herself and her unborn child. Her mysterious half-sister, Abrielle, must decide if she is more loyal to her masters in Napoleon’s Imperial France or to the family that abandoned her. Victor Frankenstein’s creature seeks justice from Ernest Frankenstein and will draw Ernest and his family into a deadly war between two rival groups of gypsies who fight to control the outcome of an ancient prophecy involving Ernest and the creature. One of these groups is lead by an imposing gypsy named Jal, whose daughter, Baseria, has been rejected by her people but may hold the key to humanity’s salvation or final destruction. Q: We all know the classic tale of Frankenstein. Why did you choose to write this sequel? A: Like many readers I was first exposed to Mary Shelley’s Frankenstein novel when I was in school. In college I took a, at the time, new course at Ohio University that studied works of Gothic literature. This was my real introduction to Shelley’s classic tale but it wasn’t until I was teaching Frankenstein for the first time to my own students in late in 2004 that I asked myself an essential question that sparked my own creative flame. In the original novel there is only one survivor among the Frankenstein family, the middle child, Victor Frankenstein’s brother Ernest. The question I had was a basic one: What would surviving the events in Frankenstein do to someone; especially when the person who lives has no idea why these horrible events happened in the first place? With this in mind I decided to focus Frankenstein A Life Beyond (Book 1 of 3) on Ernest Frankenstein because I wanted to explore the answer to my question. I also felt that the creature's story was incomplete and wanted to see how the events of his past would shape his future. The creature in my novel is not the infant/adolescent character we meet in Shelley's book. He has matured and changed, as we all do when we grow up. So why continue the storyline of Frankenstein? Aside from an exploration of victimization, the importance of family, and trust, I feel that Shelley’s tale has never been more relevant. We live in an age where science and technology continue to push new frontiers and compel us (willing or not) to face new questions of morality, wisdom, and even justice. Q: This is book one of three; what situations are the other two books going to cover? A: The creature has real power in this story. Does he seek to help, corrupt, or destroy Ernest and his family? How did he rise to power and what are his ultimate goals for both himself and humanity? Both Ernest and Abrielle must attempt to survive challenges of the heart and the soul as they confront their own dark pasts while trying to save their family and friends. As a dark, Romanian nobleman rises, what role will Baseria and her mysterious abilities play in resolving the prophecy of her people? Essentially this is one epic story that I’ve separated into three books. I decided early on that it was more practical to present the story in a series of books rather than as a massive tome. Q: How has your environment/upbringing colored your writing? A: Fortunately I was brought up in a stable, loving, supportive environment. I was always encouraged to try new things, to listen to others, be involved in the community, and to read. I’ve always had people around me who believed in me and my dream of becoming a writer. This encouragement has been essential to my growth as a person and as a writer and given me the confidence to be willing to take risks as an author and to share my work with others. Q: What about the horror genre interests you? A: To me, horror is not about necessarily about gore; it's about possibilities. I enjoy putting characters into mysterious, even fantastical, situations that they may not fully understand and seeing what choices both they and their antagonists choose to make. Horror is freeing in the sense that you get to slowly peel back the layers of a character and gain a deeper understanding of who they truly are and what beliefs guide them in this world and hopefully in doing so make the reader consider their own life as well. A: Some of it depends on the type of writing I’m doing. I have several children’s books written that I’m looking for an illustrator for so they can be completed. Most of those stories (and my poetry) evolve fairly quickly and can be very freeing writing exercises. With novel length or script projects I tend to be more methodical. I like to map out (to a degree) my characters, major plot points, and the end of the story before I sit down and actually begin composing. Even though I take these steps I think it’s important to remain flexible because life (and writing) is often more interesting when you stray off the path from time to time. Never be afraid to embrace change if it enriches the narrative, characters, or world you are creating. I typically write something everyday; it really depends on what I’m able to draw out of myself. I have days when I sit down and easily compose ten or more pages and I have others when I’m doing good to produce a paragraph. Sometimes struggling directly with a story produces great results; however, if I feel perpetually stuck with one project I might switch to another for a time before returning to the previous one. The subconscious mind is truly an author’s best friend, as is the editing process. A: I enjoy doing different voices – everything from The Simpsons, to movie characters, to politicians. People are usually amused when I break into one of these out of nowhere. I also co-host an entertainment podcast called Hindsight is 20-20 where we dissect films and discuss other directions a story could have gone. 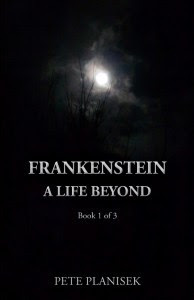 I’m hoping to complete an audio version of Frankenstein A Life Beyond and release it before 2014. I also run a small ebook publisher called Enceladus Literary LLC. A: I’ve got two novels I’m currently trying to complete: The Three Musketeers and A Lesson Before Dying and my to read list keeps getting longer. Pete Planisek lives in Columbus, OH, where he teaches English, runs Enceladus Literary LLC, and is co-host of an entertainment podcast called Hindsight is 20-20. He received his Masters from Ohio University where he founded a student literary arts magazine called Recently Eclipsed. He has published newspaper articles and is a member of SCBWI. He served for seven years as adviser/co-adviser to a NCTE award winning student literary arts publication. Frankenstein A Life Beyond is his debut novel.